Today the CIA Delegates, Jury and Contestants all moved across the Danube to Esztergom. There were no competitions scheduled for today, to allow visitors the chance to do some sightseeing. 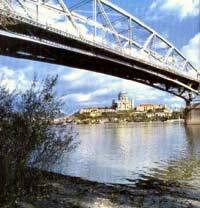 Esztergom - Hungary and túrovo - Slovakia are found where the Danube River winds its way through the picturesque landscapes of the Pilis Hills on the Hungarian side and the rolling hills and Vineyards on the Slovakian side. These diverse landscapes provide a wealth of activities for tourists who can enjoy the ease of travel between these two countries as the two regions are reunited with all their cultural heritage. túrovo is some 130 km from Bratislava, and located in the most famous wine region of Slovakia. The south facing vineyards produce some of the most sought after wine in on the foreign markets. One of the most precious resources of Nature is the hot-springs in the center of túrovo with a temperature of 39C. Esztergom is 46 km from Budapest and very famous for medieval royal Palace, the Esztergom Castle and the biggest Cathedral of Hungary (pictured right) which attracts almost 2 million visitors a year. Built between 1822 and 1869, the Church stands 100 meters high and has the largest altar piece painted on a canvas in the world. Both overlook the Danube and neighboring Slovakia. The church overlooks the Danube and neighboring Slovakia. Founded in 973, Esztergom was the first capital of Hungary and served as one of the most important towns for 1003 years. 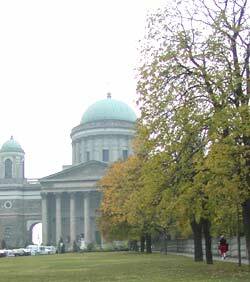 Esztergom can be described as a small old town with a warm and intimate atmosphere. 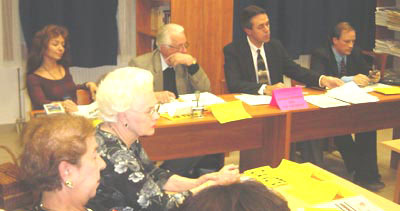 The CIA General Assembly held the second session of the 110th General Assembly where international delegates worked through the Congress Agenda. At the Assembly reports were given by the Music Committee in regards to the selection of the Coupe Mondiale Test Piece for 2004 and reports were given pertaining to the Future Coupe Mondiale Competitions which have been scheduled now until the year 2009. In addition, the CIA voted on recipients of the CIA Merit Award which honors outstanding contribution to the International Accordion Movement. This year a new award was established entitled "Honored Friend of the Accordion." This award encompasses those who contribute significantly to the accordion world, but is not necessarily limited to accordionists, it could be those who work behind the scenes to ensure the development and support of the accordion. Recipients will be announced soon. The Hungarian Accordion Association presented a concert of the group "Milonga Triste" at the Music School in Esztergom. 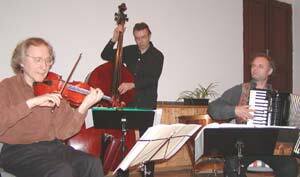 The quartet which comprises Tobias Morgenstern (Accordion), Helmut Lipsky (Violin) Stefan Kling (Piano) and Wolfgang Musick (Bass) finished their electric program with a rendition of Piazzolla's Libertango. 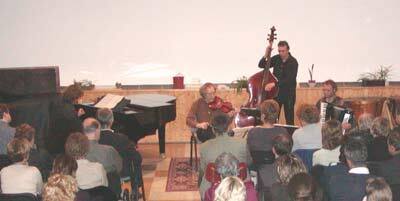 The audience demanded more and were treated to a final encore which was a piece that Helmut Lipsky wrote for his wife.